In my opinion casknr. 72323 and 105092 are the best of all Ultimate Longmorns. 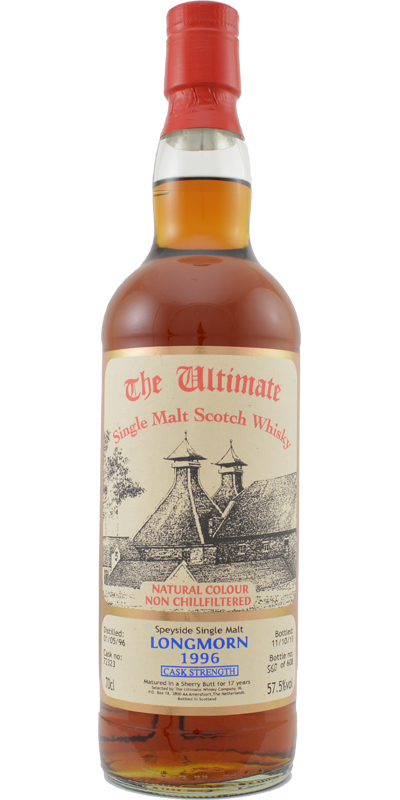 I love all Longmorn Whiskys from The Ultimate. I myself have 1 to 3 bottles of each cask and there are 8 different barrels. The Cask Strength Longmorn and Tamdhu are so far one of my favorites! It's a Sherry Bomb, you can not go wrong. But it is too crude, too unpleasant ... difficult to make a place against "rivals" of another level type A'bunadh especially on sometimes lower prices. We are clearly on Sherry, between A'bunadh and Glendro. It contains plum, some flowers, exotic fruit and even a very slight smoke. We still stay on a whisky marked Sherry, very "vinous" and suffers. A powerful attack, aggressive ... it lacks finesse. Then always with this side Sherry Bomb we find the spices, pepper and woody oak. The finish is lighter and oily. We are on the wood with the spices that intermingle without really finding their place. Then comes the coffee that stays in the mouth. What Else? I am usually not a huge fan of the Sherry Bombs, but this was a really pleasant surprise. Lots of sherry on the nose, but not the sickly sweaty pungent pinch that usually follows the big sherries. I get the christmas feeling and oh joy what a feeling. Big ABV but still carries nicely neat. There are raisins, plums, figs, cinnamon and strangely some peaches out there. Round and velvety. Leaves me wanting more. Nose: we’re in big sherry land here. Colour reveals it but the nose is screaming : first fill. Sherry. Getting sulphur too, spice and a certain caramel feeling old school caramel candy. Palate: boom! That’s some huge sherry here. abv. 55% and up if I’m not mistaken. Lots of sugar , rum soaked cherries , sultanas. Again sulphur and big XMAS cake feeling. Pepper and clove. Love that. Finish: Dried fruit with bitter notes of espresso and wood. Cherries. And cigar leaves. Based on a blind sample. Great finish, but nose and taste are a bit too hearty for my tastes. Still a solid sherried whisky. At first a bit gluey and sulphury. The hearty smells subside after a while and the sulphury smell, while still present in the background, is balanced out by whiffs of blackcurrant, caramel and dried orange peel. Sweet, very oily and intense, but a bit sharp initially. Sherry obviously. Spices like cinnamon and cloves. The spices last in a long and subtle and very tasty finish with a hint of licorice.